For the past fifteen years, AS has been many things: innovative, insightful, provocative, occasionally outrageous - but never boring! AK Press has called Anarchist Studies 'the premier scholarly journal on anarchism ... erudite, and informed. 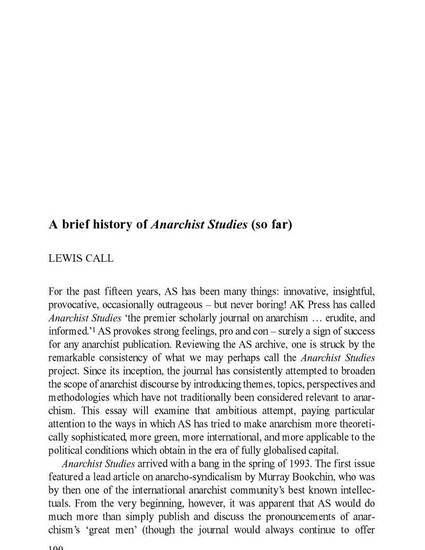 'l AS provokes strong feelings, pro and con - surely a sign of success for any anarchist publication Reviewing the AS archive, one is struck by the remarkable consistency of what we may perhaps call the Anarchist Studies project. Since its inception, the journal has consistently attempted to broaden the scope of anarchist discourse by introducing themes, topics, perspectives and methodologies which have not traditionally been considered relevant to anarchism. This essay will examine that ambitious attempt, paying particular attention to the ways in which AS has tried to make anarchism more theoretically sophisticated, more green, more international, and more applicable to the political conditions which obtain in the era of fully globalised capital. This is an electronic version of an article published in Anarchist Studies. Journal homepage: http://www.lwbooks.co.uk/journals/anarchiststudies/.